Firstly, I’d like to mention how ADORABLE all of you are as you respond to the SWEET SIXTEEN participants in the contest. You are so supportive of each other! This is absolutely TOO CUTE! Upon reading your comments and responses, I see the same KINDNESS and SUPPORT you have shown to ME during my career…and I realize again for the zillionth time how appreciative I am of ALL of YOU! We will draw the ELITE EIGHT tomorrow…and they will be published on Saturday! Good Luck to ALL! You have also asked what will happen with the postcards after the contest. As I mentioned in the original contest guidelines, by submitting a card to ME for the drawing, you are also granting your permission for ME to use your card in the future. John and Dottie have been reading them and enjoying all of your wonderful and inspirational thoughts. In the future, Dottie will think of a way to share them with ALL of YOU…in one form or another. The words are too special and the thoughts too kind not to be shared with MY DEAR FRIENDS! Thank YOU for being YOU! Another thing you asked about in the responses is the HORSE PLANE. This is a topic in which I do have experience. 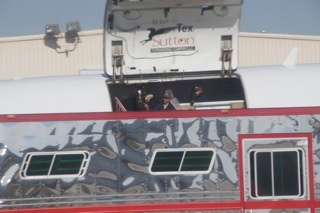 In the above photo, you can see ME (my blaze stands out in the crowd) with members of MY TEAM getting ready to deplane. I always flew on TEX SUTTON planes so my comments will be based on my personal experiences. The Sutton plane is designed to accomodate approximately 21 horses in all. The plane is divided into ‘rows’ with 3 stalls in each row. It is set up just like a horse van inside with the stalls being OPEN so the horse can see things going on around he/she and not feel closed in at all during the flight! Per my John, that is the beauty of this plane…it is secure, safe, and open at the top for the horse not to feel closed in at all while traveling! On the day I was flying, the van would pick me up at the barn. MY BELONGINGS (tack, blankets, equipment etc.) would be packed and ready to also travel with ME! Before I’d be able to travel to another state, I also had to have a HEALTH CERTIFICATE and a COGGINS completed to certify several things: I was healthy and fine to travel and also that all of my vaccinations were current. This paperwork is extremely important and would always TRAVEL WITH ME! Once loaded on the van, we’d leave BARN 55 and be off to the airport. Tex Sutton planes fly out of Ontario, California. It is about one hour plus driving time to get there from Hollywood Park. Members of MY TEAM traveled right with ME! Mario always flew with ME and went with ME on all of my van trips. When possible (meaning depending on space) Steve, Frank, and / or John would also go on the van and / or plane with ME. Once we’d land, the plane doors would open up…as you can see above…and Mario and I would walk right down the ramp directly into the waiting van. This is an amazingly WELL-ORGANIZED way to travel. All of these people do a great job to make it so safe and yet relaxing for the horses! As a matter of fact, my JOHN has some video of ME while on a plane trip! I’ve got an idea…why don’t you COME FLY WITH ME! @LauraJ, JSmith, MLV. Such good points made. @MLV your post about your TB reminds me so much of my sweet mare, Jess, when she was turned out the first time at 11 years old. At first, she looked a little confused and then she caught on and took off across the 10 acre pasture, head and tail up, nostrils wide and loving every minute of it. Her pasture buddies caught up with her and there she was – running with her herd! I stood there with tears running out of pure joy that I was able to give that to her. She spent the rest of her days in the pasture during the day when weather allowed and in her stall at night and happy and content every single day. She had done 7 years in the show ring and that was enough. She was born a horse first, she followed my wishes for a long time and deserved to finish her years as a horse last doing what horses do. @Jan, I quote you, “Frankly, many have said Zen still has the desire and ability to extend her career and perform say in dressage”. I do believe the people you are quoting are expressing their desire for Zenyatta, not what Zenyatta actually “said” since Z can’t talk and say that directly. As much as we all love Z, let’s not confuse the actualities of her ability to communicate. Z only talks through Dottie and her body language says the rest. I see a horse that is thoroughly enjoying being a horse and doing what she could not do for 4 years. Z girl, keep on keeping on and enjoying your new life. You have more than earned it! @Celeste–I hope you’ll be able to overcome whatever negatives the lab reports disclosed. Best wishes to you. ‘hooves’ crossed for you in the drawing! To answer your question…I’ve had some personal challenges in recent weeks which have kept much of my focus busy elsewhere, but Zenyatta, her team, Dottie, and the blog community continue to be in my heart. I check in to read as much as time allows as often as possible. Aren’t we all fortunate that so many loving, caring, kind people come here on a regular basis?!?! On another note, as we get closer and closer to knowing who the new holder of the Zenyatta bronze will be, I’d like to echo a post from awhile ago suggesting the winner hold a viewing party for all within driving distance. TOO CUTE!! Apple Blossom. It’s been a year since you ran in that. You made racing so exciting for me, Zenny. Love you. Have a good weekend!! @ THANK YOU SHARON CALL, LISA G, MLV and LAURA J for your response to the comments of JAN. I agree – Zenyatta is enjoying being a horse and doing what she could not do for 4 years. Aside from being happy THANK GOD she retired healthy unlike others who were not so lucky! Her racing days are over and she deserves it! Thanks to Dottie and the Z Team for creating this website for us. Dottie does not even have to do this as often as she does. Let’s be grateful! I am a frequent visitor to this site and own some horses and a fan of Z. After reading some recent comments I felt compelled to express some observations. I noticed some are using this site to judge others for their own private feelings on missing Zen and wishing there was more updated news on Bernardini. I totally understood Jan’s frustration,just by teading between lines.Zen is not just like any other horse, is she? She clearly thrived on the adoration. Even Mike Smith said she really loved racing and competing which is why she was brought back another year. Perhaps Jan only suggested as others have in numorous articles if she is not to be bred this year,her affinity for dressage footwork might be a consideration since she is in such good health. It is not uncommon for such mares to take time off a season to breed. Sounds like Jan might have some knowledge of this. Many of us look at Z like she is a human or a member of our family, trying to imagine things from her point of view don’t we? Hence the ”she must be so bored” statement. It is obvious we all appreciate what this experience has meant to us all. Therefore none of us has the right to feel superior or judgemental that we can speak on behalf of The Mosses. We each should be allowed to express our own thoughts on how this wonderful horse has affected us. Dottie speaks on Z’s behalf,why can’t we? How do know she is NOT bored? I think the Z facebook page is the place to chat back and forth or make comments about one another, not here. Way too much clutter that nothing to do with Z , horses or The Mosses. Please be more respectful and resist the urge to critique people’s comments and tell them how they should feel. This site needs to be safe and non-threatening. @Robert, I would just like to point out that, having ridden dressage, it is not something a horse can do for one season. It takes years of practice. Plus, Zenyatta is worth millions of dollars. It would make absolutely no sense to put her in that kind of training. The only ex-race horses that go into dressage or any other sport are no longer used for breeding. That is just the way it is. I have no doubt she loved racing. She loves to run and now she is even more free to do that. You should visit the farms in Kentucky and observe how these horses are cared for. I don’t think anyone meant to come down on Jan. This is a very educational site and we are learning new things every day. Hi Z; had so much going on. I am late answering this post. I would love to come fly with you anytime!!. Z, are you strapped at all for safety reasons? I am so glad your favorite people were with you, because this is quite an expeience. I love you Z! love with a kiss on your soft nose. I anticipated you’d be the first one to respond. Still can’t resist instructing others what you think they should do,can you? Your assumptions are again incorrect,now in my life. My profession dictates much research. I have spent a lot of time visiting KY horse farms. They are top notch. Zenyatta is being treated like the queen she is.Still being spoiled I think. Also,more than one equestrian site was where I was informed by experts suggesting Zen’s owners consider her for dressage saying due to her natural ability it may not take the usual length of time to train her. These sites also discussed mares breeding first then training and performing later. More than one contributer to Z’s website with an equestrian background also suggested the same idea. However,that being said MLV,you so totally missed or ignored my main point. I was referring to people’s arragance and unsolicited advice. Sharing is one thing. Being critical and presumptive is another matter and can hurt others. We need to more careful what we say. It is usually best not to say anything. A remarkable article, ‘Time for a freshener?’ was published July 10, 2006, by Denise Steffanus for Thoroughbred Times. Among the veterinarians quoted is Dawn Hunkin, who cared for both Giacomo`s & Zenyatta`s careers. http://www.thoroughbredtimes.com/horse-health/2006/july/10/time-for-a-freshener.aspx *See Dawn Hunkin, DVM. pictured next at Diary Post #228, caring for the #19 Nina Kaiser ‘Zenyatta’ ‘Elite Eight’ finalists drawing. ..
Miss Z, it was fun going on a virtual plane ride with you and Mario. Thanks for sharing your flying experience. Take care. @ MLV- I love your posts & concerns for horses especially Zenyatta. You are right on! @ Robert- All I can say from my knowledge of TB horses is the owners & the trainers know BEST. On this site we are ONLY OBSERVERS, no matter what experience or reserch anyone has. Everyone is free to express their opinion & suggest about Zenyatta. It is for sure everyone including me has an opinion. THE ONLY OPINION THAT COUNTS IS THE MOSSES! What they do, how they do it or when they do it or why they do it IS ALL THAT MATTERS. They have done the BEST for Zenyatta her whole life as evident of how sound & healthy she is after racing such a historic career. Zenyatta has nothing to prove to anyone in any area of performing as a horse. I love The Mosses & John Sherriff for loving and truly caring about Zenyatta. We are just lucky to be able to benefit because they have allowed access to Zenyatta especially throught these Posts. Robert,so yes, Zenyatta is a horse, we, her true Fan Family on this site know that but oh, what a horse she is. She is so much more to so many people. Zenyatta deserves everything that money can buy to make her happy & content to have a long happy retirement. Everythink you do Zenyatta is with such confidence. You fly better than some people. You go girl. Love you Zenyatta. Robert, you go on and on about how people shouldn’t be so judgmental of each other, but here you are doing the same thing yourself. You also say that people who discuss something other than horses or Zenyatta should do it on Facebook rather than this site. It is not your place to decide this kind of thing. It is Dottie Shirreffs’ place because this is the site that she started. If you want to use certain criteria for yourself, fine, but don’t force your opinions on other people. Just because you are a horse owner and a racetrack visitor does NOT give you that right. If you want to tell people what to do, start your own website and make your own rules there, not on someone else’s site. Zenyatta, I am very happy that you and your staff are keeping the postcards that were sent to you by people entering the contest for future use. I sent my own postcard in and I very sincerely mean every word on it that I said about you. In fact, I have them on a piece of paper that I carry around in my wallet. It really sounds like you fly in luxury. I commented in a previous post that you probably got bored flying on an airplane, but it looks like I commented out of turn. First, it’s cool that these planes can fit 21 horses. Second, there are rows for the horses and they can wander around and see what’s going on during the flight. I’m jealous. I don’t think people get treated this well on flights most of the time. Next time I fly, I’m thinking of booking on Tex Sutton, but I don’t think they have flights out to where I live. Wow, girl, you are living in the lap of luxury. I would kill for the rare privilege of flying with you and other horses. I had no idea that you had gone out to California. It sounds like better organized air travel than most people experience. Furthermore, you have your own personal flight attendant in the form of Mario. Once again, it sounds like they don’t kid around about health records, racing history, and whatnot following you around everywhere you go. These GHD hair straighteners can be utilised on any duration of hair whether or not it is quick spunky bob or lengthy pretty tresses.It is suggested to segment your hair employing small clips, prior to making use of the styler. [url=http://forum.zscasta.sk/viewtopic.php?f=2&t=10921]tiffany and co sale[/url] Now we have online stores everywhere, no crowds, no lines and the best part you do not have to go from store to store to find the right pair. [url=]ghd lisseur pas cher[/url] The Ralph Lauren range of men’s fits have used distinct supplies through the years. These days, I will advise some renowned stars’s lovers onValentine’s Day, so several of the traditional pairing is enough to meet up with everyone’s wants rather.In the past when you failed to want to go to a shop or lived way way too significantly absent, the catalogue was the only choice and often there was only 1 catalogue to pick from.